Foundation: an unmatched motion dynamics. An impressive tact and moderate acting stallion with an overwhelming movement technique. His older brother two years Fiderstar also examined, completed a good performance test with a grade of 9.25 for Rittigkeit and was already successful in the dressage ring. Another brother was at the elite foal auction in Verden for € 43,000, - sold. Foundation believes very confirmed generous movement, and an excellent working hind a huge aura. His father was the shining Fidertanz champion stallion in North Rhine Westphalia, has been successful at small tour level and brought many top horses, champion stallion Flanagan and several approved sons. Foundation comes from the highly successful sports tribe Paninka; Weniga grandmother brought together with the Quattro at Prix St. Georges level Queeny successful. Also released this dam line the multiple Grand Prix winner Apache OLD Isabelle Werth, Escapado Hans Peter Minderhoud, the Small Tour horses Lucky Luke, Wivara, Wocelli and S horses Adolfo FRH and Cheyenne. 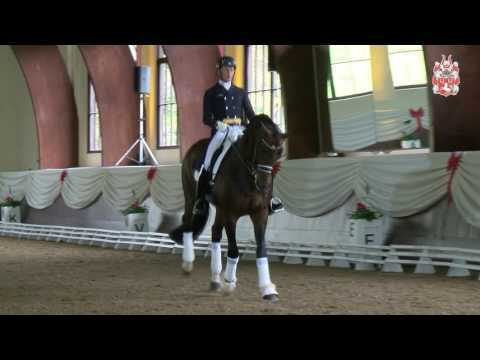 With Foundation presents a very interesting dressage stallion, with his attitude, actions and respect the spitting image of his father embodies.